I hope you enjoy this gallery of images from my recent ‘Scuba Vs Tumour’ adventure in Bali, Indonesia. Please scroll down for my article on this trip and stay tuned for AMAZING video footage of me playing with a train of 8 mantas doing their extraordinary mating rituals (to be added to this post upon completion)! The following article appeared in Dive Log Australasia, July 2016 (text reprinted below). I have a confession to make. 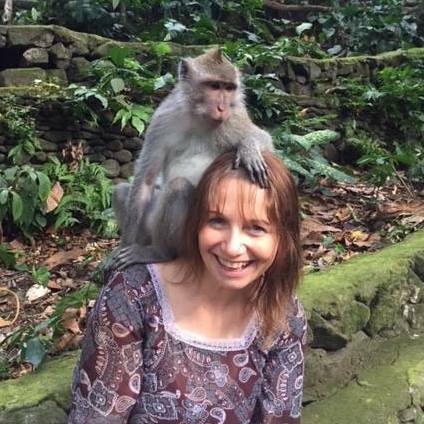 As much as I love diving several times a week in water so cold I can barely feel my legs, travelling to Bali in May for some tropical therapy was more temptation than my frozen toes could resist. Besides, over the last few years, my beloved Spunky Abe appears to have become a Warm Water Princess, denouncing Melbourne diving and declining any location that requires more than a 5mm. So lured by warm water, promises of wrecks for him and the possibility of mantas for me, we joined a group tour of the hallmark dive sites of Tulamben, Nusa Lembongan and Nusa Penida (full tanks to Sharene of Daktari Surf and Dive and Agung of Bali Diventure who expertly managed every aspect of this trip). Our first few dives were spent weaving through the endless labyrinth of bubbles and fins at the ever-popular Liberty wreck which easily hosted 100 divers at a time, though fewer before sunrise and after sunset than in the bright light of day. Highlights at the Liberty wreck included the brightest pink leaf scorpionfish, a huge moray eel hunting at night and gentle interactions with enormous bump head parrotfish that come up from the deep to the wreck as the water darkens. I also spotted a large spanish dancer with its enormous pink egg ribbon close by, along with a rainbow’s spectrum of leaf scorpionfish, though I cannot tell you how disappointed I was to have missed the mimic octopus sighted by others, putting on quite a show by all accounts. More exciting for me than the wreck itself were the unmissable Coral Gardens accessible by shore (though a substantial swim) from the same entry point. Several years earlier at the Ocean Film Festival, I had been enthralled by an outstanding short film called ‘The Coral Gardener’ featuring the impassioned work of Austin Bowden-Kerby and his success with growing corals in Fiji. The Coral Gardens of Tulamben are reminiscent of the awe-inspiring images I had seen in this film, offering a myriad of infant and intermediate corals growing on all manner of structures. New corals stem like flowers from collections of beer bottles, adorn tall wire pyramids and many other innovative brick and wire bases, each one uniquely demonstrating Bali’s typical artisan flair. The grand finale of this site boasts an impressive and inspiring collection of large underwater statues and temples, paying homage to Balinese culture and inviting endless photographic opportunities. There is a similar though less impressive set of statues near the Japanese Wreck at Ahmed, though for me the absolute highlight in this region are the Underwater Pyramids. This dive commences against the stunning backdrop of the Agung volcano, while thousands of garden eels greet you as you descend. Dozens of large brick pyramids rise as artificial reefs from the ocean floor, each one bejewelled with more creatures and features than could possibly be explored within a single drift dive. After transferring from Sanur by speedboat to the island of Nusa Lembongan for the last two days of the tour, my Bucket List dream of seeing a train of mantas dancing through the water was momentarily shattered. We were advised that our much-anticipated expedition to Manta Point was unlikely to go ahead due to rough conditions. But thankfully by the following morning, the skipper had reassessed the forecast and managed to drop us in on at least fifteen mantas, including a train of seven athletic males chasing a large pregnant female they were all striving to impress. Their exquisite choreography, heading straight towards us and directly over our heads for the next eighty minutes, was without doubt one of the highlights of my bubble blowing life. The thrills of Manta Point were followed by an obligatory visit to Crystal Bay with its infamous down currents and its formidable list of diver casualties and fatalities. While the site itself held little appeal for me in terms of topography and marine life, I might possibly be tempted to visit again during the forthcoming Mola Mola season. Our final double of the trip featured steady drifts off Nusa Penida at Sental and SD Point, the latter of which showcases some of the healthiest and most lush hard corals imaginable. As I sit in my glass walled hut in Ubud looking out over a small waterfall and writing this article, I am beyond grateful for the life that I have been given to live and the underwater adventures I have been blessed to take. I look forward to my next adventure. Though I have no idea what that might be, I am open to suggestions (‘Have Fins; Will Travel’) and I look forward to sharing my experiences here with you. 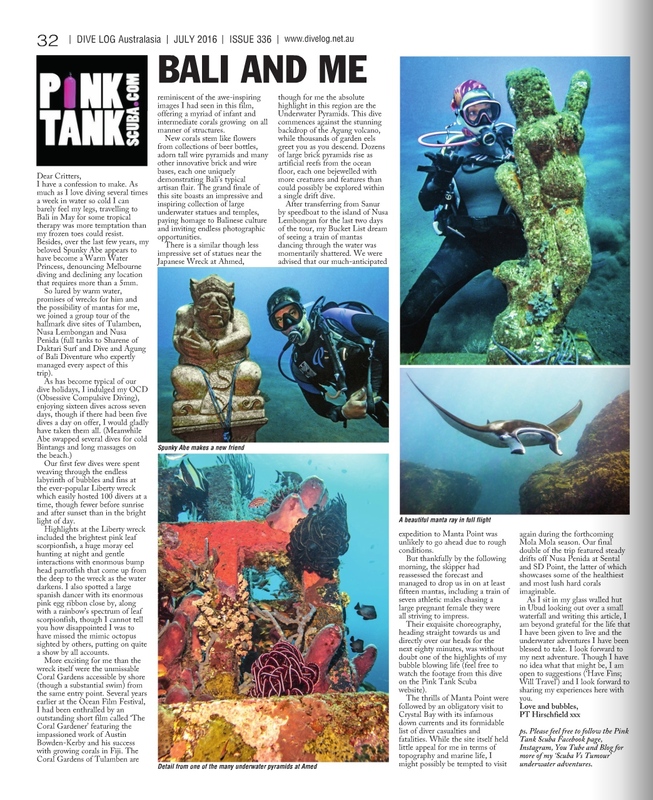 ps Please feel free to the subscribe to the Pink Tank Scuba Facebook page, Instagram, You Tube and Blog. This entry was posted in Image Galleries, Photos and tagged adventure, Bali, cancer, diving, endometrial cancer, manta, manta ray, nature, Nusa Lembongan, Nusa Penida, ocean, photography, pink tank, pink tank scuba, pt hirschfield, romance, scuba, scuba diver, scuba diving, sickness, statue, statues, Tulamben, turtle, underwater. Bookmark the permalink. Your photos leave me breathless! Your trip and photos are incredible!